2016 was a year of particularly bad news for the news business. At the national level, presidential candidate Donald Trump repeatedly lambasted the nation's best-respected news outlets, haranguing the "failing New York Times" and banning the Washington Post from his press pool. Since candidate Trump became president-elect Trump, journalists have been criticized – and criticized themselves – for their short-sighted election coverage. At the local level, signs have been similarly dire. The Detroit News and Detroit Free Press both announced their latest rounds of staff layoffs and buyouts, with the News this time offering buyouts to its entire editorial staff. Even the TV business—typically less dismal than print news – took a hit, as Fox 2 cut three of its most recognizable on-air personalities. But for the unconventional outlets on the metro area's independent journalism scene, 2016 was actually a good year – for some, their best yet. As Metromode spoke with those working to fill the gaps in Detroit's crumbling traditional journalism market, the overwhelming themes were hope and positivity. They reported strong audience support for their work, bold rejection of current industry conventions, and even a positive attitude about Trump's effect on their work. We spoke with three of the metro area's unconventional, independent media outlets to find out how they've been weathering the storm in their industry, and how they view the path forward. Oakland County 115 (OC115) publisher Crystal Proxmire is still getting used to strangers recognizing her when she walks down the street. "It really freaked me out, like, 'You guys shouldn't care about me! Read the website,' you know?" she says. "It took a lot of growth to get from being painfully, horribly shy and not wanting my name to be part of this at all to realizing that the reason people were relating to it so much was because they'd seen me walking around town and they'd seen me on Facebook, doing the work." Proxmire majored in advertising at Grand Valley State University because "everyone told me journalism was a horrible profession and there was no money in it." But when she graduated in 2005 she was set on pursuing a journalism career anyway. After a failed attempt to start a newspaper in Muskegon, where she was living at the time, Proxmire moved home to Ferndale and started a biweekly news website called Ferndale 115. 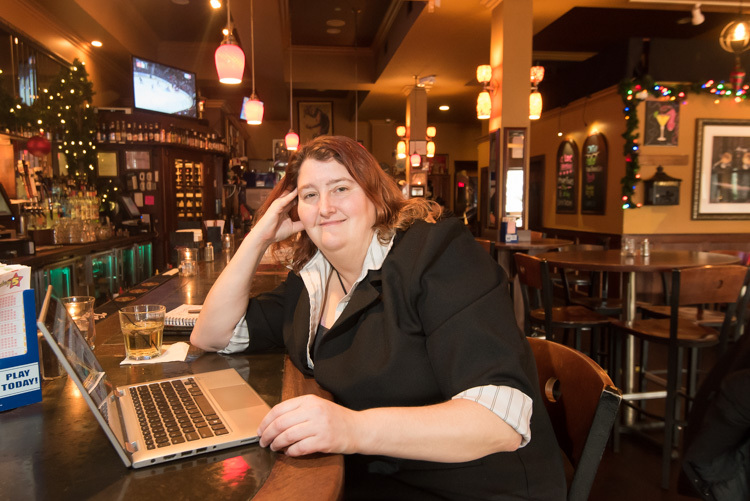 Two years ago, she renamed the publication, broadened its focus to include the whole of Oakland County, and made the website her full-time job. Crystal Proxmire. Photo by Doug Coombe. Proxmire occasionally employs freelance contributors and engages volunteers for some event coverage, but OC115 is essentially a one-woman operation. Proxmire hastens to note that she's not making a lot of money off OC115. The site derives revenue from both traditional ads and an "online community garden," a page where readers can make a $15 monthly donation for an online "flower" in their name. "I want people to really think about the value of journalism to their community," Proxmire says. "Having their name on the page matters to them. Being able to look on Facebook and see themselves as part of it, seeing it as a whole community thing, is important." Proxmire works hard to keep up her end of the bargain by focusing on stories that other local outlets aren't covering, like her lengthy series of stories on corruption at the Ferndale Housing Commission. That project won her an investigative journalism award from the Detroit chapter of the Society of Professional Journalists. Proxmire says she hopes to continue building reader contributions so she can begin to hire other reporters. However, she describes her work as filling existing gaps in local media's coverage, rather than competing with any single existing outlet. She says the ongoing deterioration of the established local media makes her "sad" but "also optimistic." "The Internet and the chaos that we're all going through is just part of what's making it possible for me to eventually be successful," she says. "My job is just to figure out what's happening and report about it and trust that there's always going to be a need for that." Ads have long been a key part of media outlets' revenue stream, becoming increasingly important as paying subscribers have dropped off. But this year Motor City Muckraker editor and publisher Steve Neavling decided to cut ads from his website entirely. Neavling says the Google AdWords service he was using for ads didn't bring in much money to begin with, and he wanted to dissociate himself from the increasingly predominant "clickbait" model that prioritizes pageviews over quality of content. "It's a very short-term goal, but you're eroding your brand by writing about silly things to get clicks," he says. "People need to associate your brand with important news." 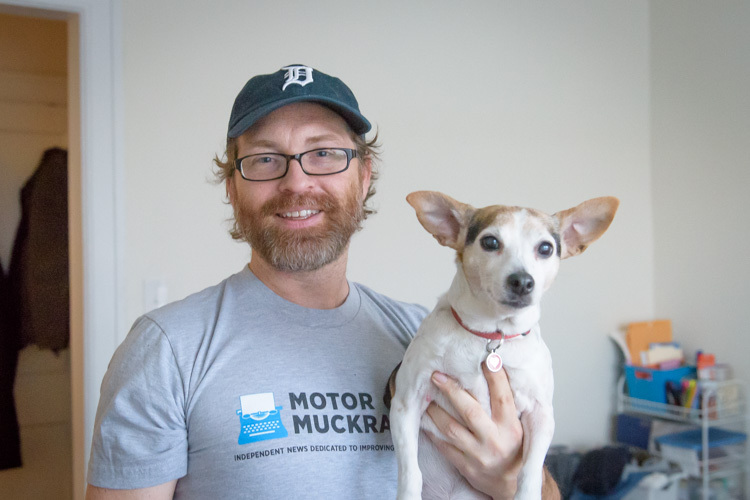 Neavling, a former Detroit Free Press reporter, has worked hard to build a brand out of countering the local mainstream media's narrative on Detroit news since he started the Muckraker in 2012. Most recently, he's covered discrepancies in Detroit's election system and worked to emphasize the logistical hurdles that lay ahead for the Pistons' move from Auburn Hills to Detroit. Steve Neavling and furry friend. Photo by Doug Coombe. It seems Neavling's audience is willing to financially support that work. Neavling held the Muckraker's first official fundraiser this summer, bringing in $22,000. That's a significant step forward for the Muckraker, which last year turned a profit of just $8.02 despite Neavling's reported grueling 80-hour work week. Like Proxmire, Neavling attributes his recent success to building a distinct and trustworthy brand from the ground up. "The millennial generation have grown up with news being free," he says. "Now that these companies have taken large hits and are laying off lots of reporters and aren't always reporting on important information, when people see that going away, they see a need for it to come back." Neavling foresees an even brighter future for his endeavor under a Trump presidency, although he's no fan of Trump himself. He says the mainstream media failed by over-reporting Trump's near-constant tirades without providing appropriate context and fact-checking, opening themselves up to what Neavling describes as "legitimate concerns" about bias from both sides of the political spectrum. "People are looking to independent news to get information because they feel that perhaps the mainstream media is bought and sold," Neavling says. "I don't really believe that, but I think that is the one good thing to come out of the Donald Trump presidency." Pulp more or less contains everything one might expect of a community arts and entertainment news publication. The website's daily coverage includes artist interviews, critical analysis of concerts and artistic works, and guides to upcoming events, all focused on the Ann Arbor area. But beyond the surface, Pulp is a wholly unique experiment. It's published by the Ann Arbor District Library (AADL), and therefore funded primarily by taxpayer dollars. What's more, when Pulp got started in late 2015, AADL deputy director Eli Neiburger says the library didn't look at it as a journalism project. Neiburger says AADL was simply responding to feedback it had received both from local arts organizations who were concerned about dwindling news coverage of their events, as well as community members who were seeking a resource to follow local cultural goings-on. "We saw what libraries do," he says. "We saw an information gap that we had an opportunity to address. Because we already have the infrastructure and we already have many people on staff who are enthusiasts, if not experts, about arts, we thought it was a good way for the library to add value to the community." Josie Parker. photo by Doug Coombe. Neiburger says Pulp was inspired by Fine Print, a books blog written by staff at the Traverse Area District Library, which includes author interviews and more traditionally journalistic content alongside book recommendations. Pulp took that concept to the next level by emphasizing local artists, presenting a broad range of coverage, and paying local journalists to write some of its content. Pulp suddenly found itself occupying a much larger community void in early 2016, when MLive announced 29 layoffs including the Ann Arbor News' only dedicated arts and entertainment reporter. 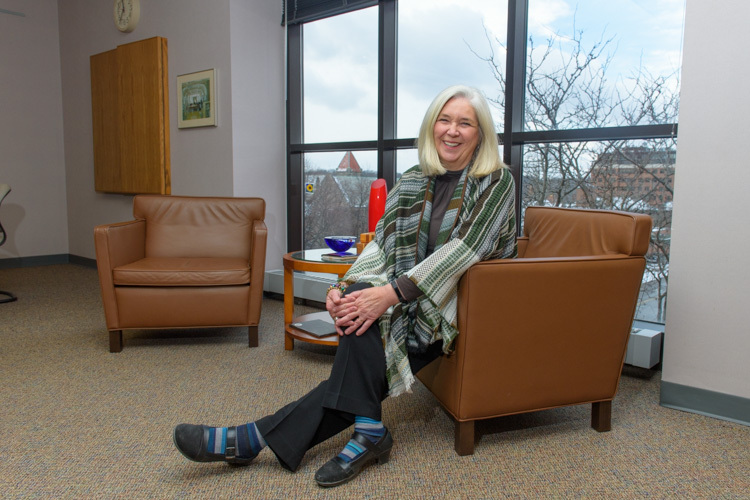 Pulp had unwittingly become the most robust source of Ann Arbor arts news, and AADL director Josie Parker says she began to field some "pointed" questions about the library inserting itself into the world of journalism. "I find it curious, personally, because I think that it's coming from persons who are still frustrated by the lack of print news and/or the lack of journalistic quality of online news," Parker says. "They're afraid that having something like the library do something the way we've done it with Pulp means that there's no hope for them of ever seeing news the way they were used to it or valued it." Parker says she usually turns that question around by asking who should be doing what Pulp does, if not the library, and the concerned parties usually don't have an answer. Overall, community response to the project has been enthusiastic. During a community phone survey conducted just five months after Pulp's launch, Neiburger says 18 percent of respondents had heard of Pulp, and most had a positive impression of it. He expresses hope that other libraries might adopt a similar model in communities that are hurting for arts news coverage. Neiburger doesn't advocate for traditional hard news becoming a part of any library's mission, but he says providing arts news is right in any library's wheelhouse. "We see this need, we see that people are interested in it, we find a local expert, and we pay them to produce something for that audience," he says. "Usually, for decades, that's taken the form of public programming. This is exactly the same thing, only now we're asking them to write something instead of make a slide deck."